This simple game is driving the world crazy! All you have to do is tap the screen or keyboard to flap your wings and avoid crashing into the pipes. Sounds easy? Think Again! It's tough, fun and maddeningly addictive! 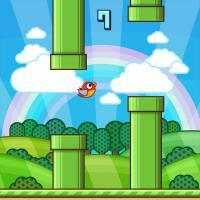 Flapping Bird also features an array of stunning backgrounds, highscore tables and crazy background music. Top ten chart positions the world over!